We arrived into Warsaw after nine hours on a bus from Vilnius. I have to say though, that it really wasn’t too bad. The seats were comfy enough, there were toilets, coffee and tea facilities, seat back tvs, and best of all for me, decent wifi. That meant I had the whole trip to write and work! Previously we had visited Krakow in Poland, but we were back this time to see the capital. It was late afternoon we we got off the bus, and we had splashed out on a Hilton for the three days here. It wasn’t too far away, and after sitting for so long we were happy to stretch our legs and walk. At checkin we were upgraded to an executive room, which meant executive lounge access too, and happy hour was only fifteen minutes away. Just enough time to drop off our bags and check out our room. A couple of glasses of wine later, and I was ready for a good nights’ sleep. It was so nice to wake up the next morning and see blue skies. We had a lot of walking planned for the day, and it would be so much nicer if it wasn’t snowing this time. Our first task was was to work out the Warsaw public transport. Not far from our hotel we had walked past some ticket machines, but they were in the wrong direction to our nearest bus stop. We walked to the bus stop, but found no ticket machines, so back we went in the other direction. Tickets are really cheap, 3.30 zloty ($1.17 AUD/$0.88USD) for a single trip ticket. There are plenty of other option too, and they can easily be bought at ticket machines pretty much everywhere (except our bus stop, ironically). 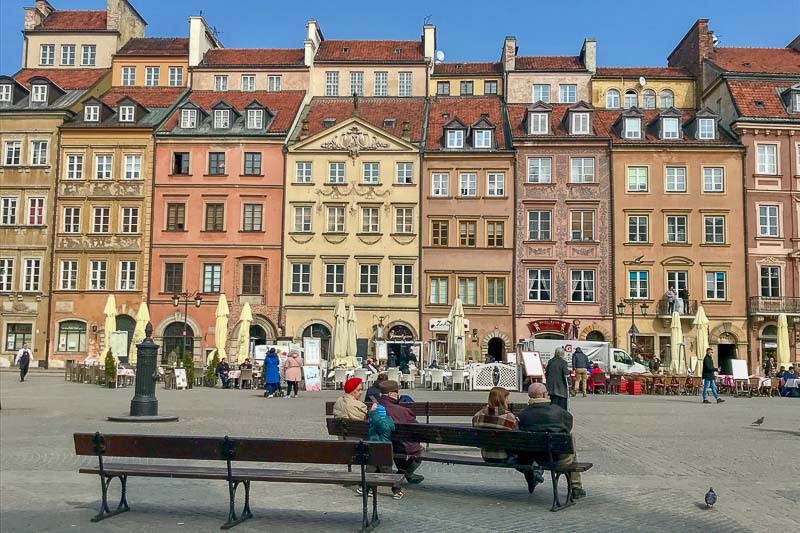 Since we were now in the wrong direction, it was closer to jump on a tram, then a quick fifteen minute trip to the other side of Warsaw, the left bank, or Praga as it is officially known. Here we met up with a guide at the Praga Cathedral (also known as the Cathedral of St Michel the Archangel and St Florian the Martyr) for our first walking tour of the day, a street art tour. The Praga district was originally a completely seperate city, with the river forming a natural border with Warsaw. Over the years bridges have been built and the two cities became one, but they are very different. Praga is the working class area. There’s no old town here, just a lot of different buildings from different eras, some renovated, some not. It’s still a bit rough around the edges, but changes are slowly happening. Interestingly, this area was not bombed extensively like the other side of the river, hence more of the older, unrenovated buildings remain. 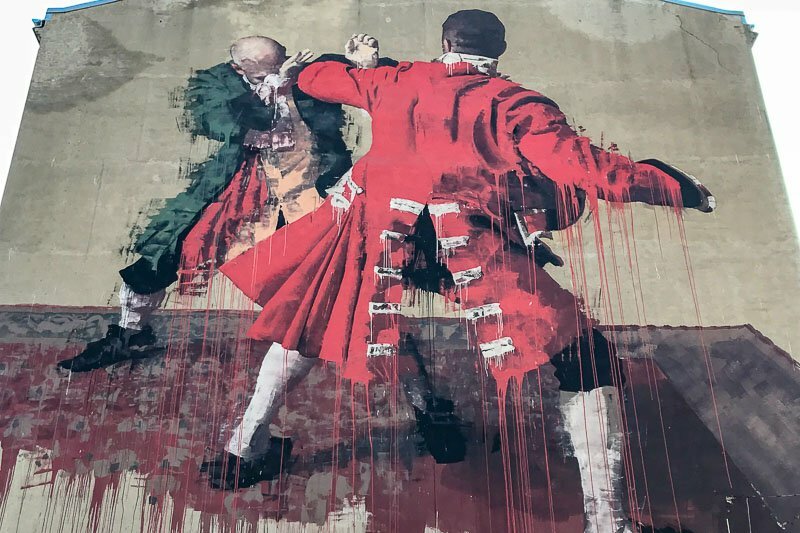 This walking tour was focused on the street art in the area. They ranged from some huge, whole-side-of-building pieces to some sculptures in the park.There were of course many pieces in between, such as the local Banksy imitations. 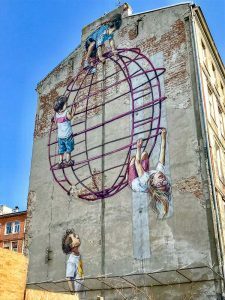 Many of the pieces come from an annual festival held in Warsaw where various well known street artists are invited to do a piece of their choice. This one was controversial. They neighbourhood did not want to be depicted as a violent place. Some of the other pieces were, interestingly, advertisements. The first one below was actually part of a McDonalds campaign a few years ago, but people like it and it has stayed. The famous golden arches have been removed, but this was part of a popular marketing campaign a few years ago. As always when doing a tour in a less than salubrious area, there seems to be one local who has to show the foreign visitors his (usually!) displeasure at the intrusion. Here someone started to video our group, and when our guide asked for him to stop, it escalated to threats of police being called. It didn’t get too heated as our guide stopped interacting and moved us along, only telling us later what had occurred. As she said, he seemed to have had a very big Saturday night (we were doing the tour on a Sunday morning). One of the interesting parts of the Praga district is the zoo. In years gone past it was often the only reason why residents from the other side of the river would venture over the bridge. It was very popular to spend Sunday’s in summer visiting the zoo and the nearby park. The Warsaw Zoo is also the setting for the true story told in the 2017 movie “The Zoo Keeper’s Wife”. By hiding them in a villa in the zoo, the Żabińska family were able to save at least 300 (possibly many more) Jewish people during World War II. 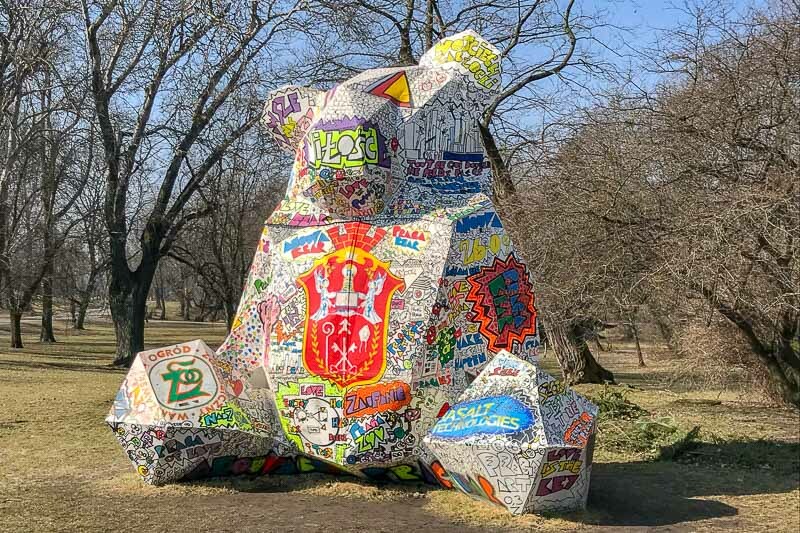 Street art is more than just paint on walls, this bear in the park is another version. After the morning tour, we grabbed a bite to eat at a nearby shopping centre then walk back over the bridge to the Old Town. The Warsaw half marathon had been run in the morning, and we got to see many of the exhausted looking participants proudly wearing their medals as they left the area. 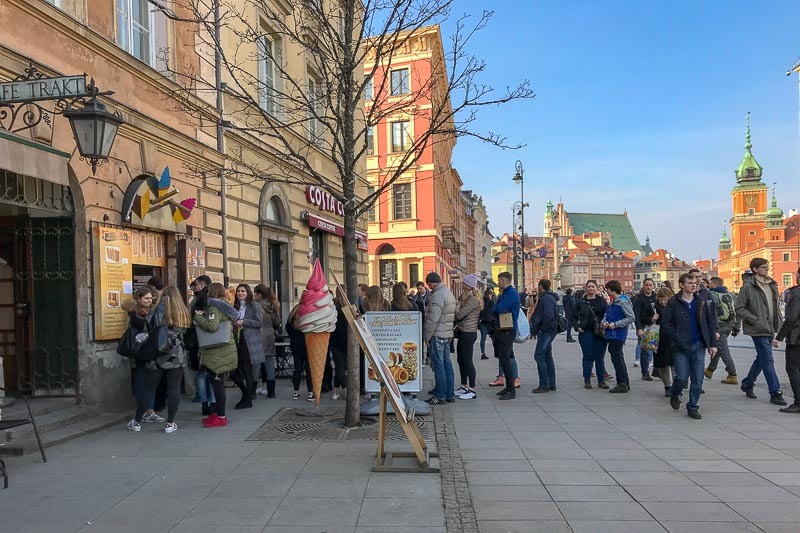 They mingled with the usual European weekend visitors, and all the locals who had emerged on the first sunny weekend of spring, to create a crowded but buzzing old town. It was crazy to see lines out the door or almost every eatery and ice cream/chimney cake stall. Even Pizza Hut had a line of about fifteen people outside the door. We found our guide for our second walking tour of the day, this time through the Old Town. This ended up being one of the largest walking tour groups I had ever been a part of. Probably close to fifty people. As we saw other groups around, this seemed to be the norm, with the Spanish tour from the same company having the same amount of people too. 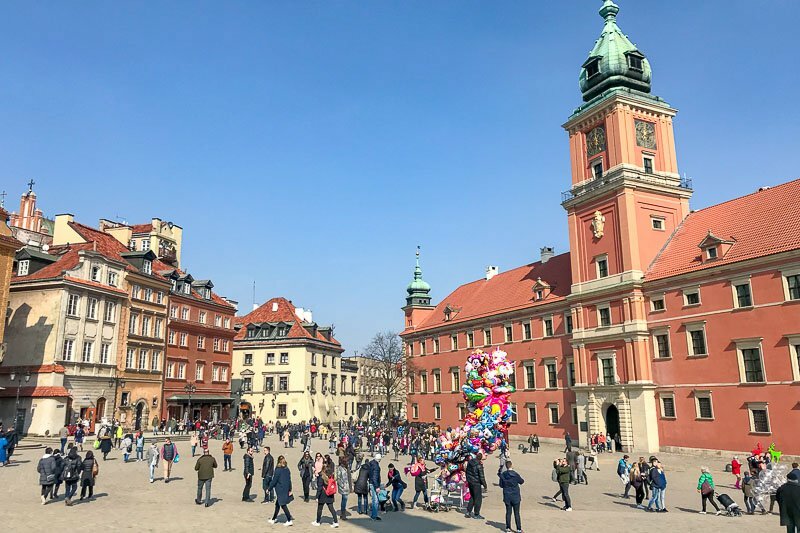 Warsaw is clearly a very popular weekend destination for people living in Europe. 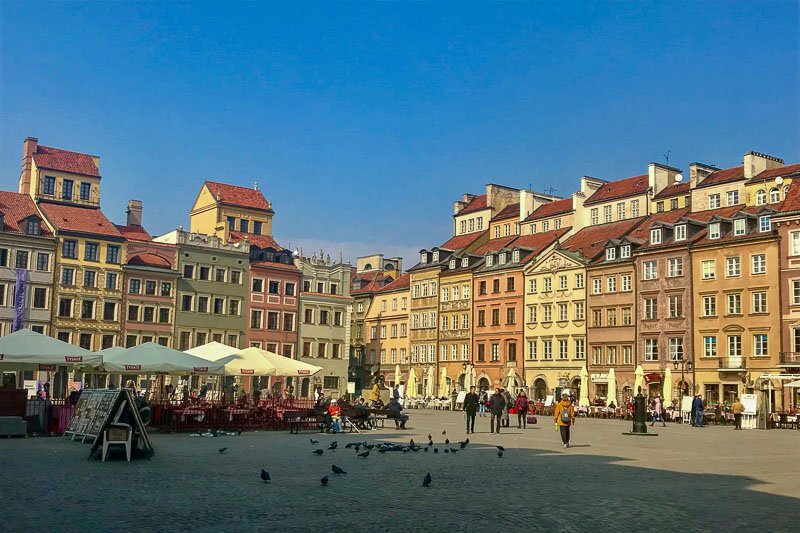 The Warsaw Old Town is unique in that it’s the newest one out there. Yes, it’s only about 60 years old. But how is it an Old Town then I hear you ask? I suppose that’s really a matter of interpretation. 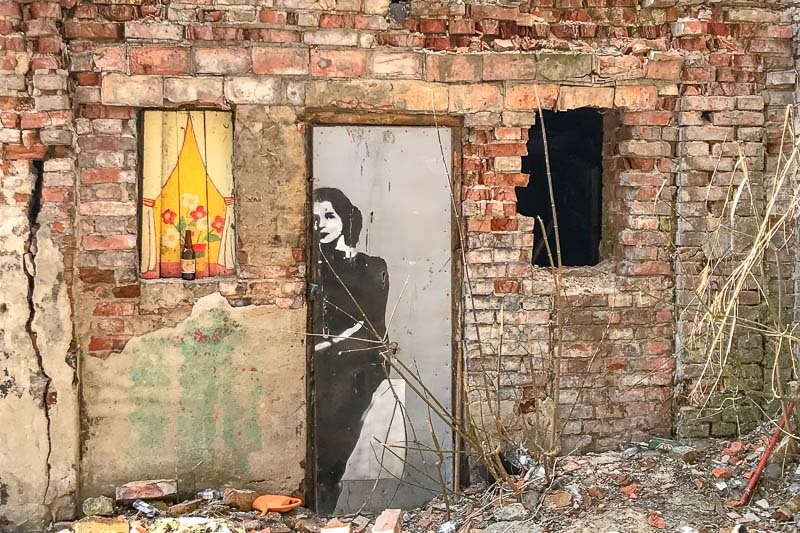 This area was heavily bombed during WWII, but luckily there were enough photographs that when it came to be rebuilt, it was able to be done in such an authentic way that UNESCO still recognised it as having the same character as if it had not been damaged at all. So there are still cobbled streets and a royal palace, a cathedral and about a hundred other old churches (maybe I exaggerate!). 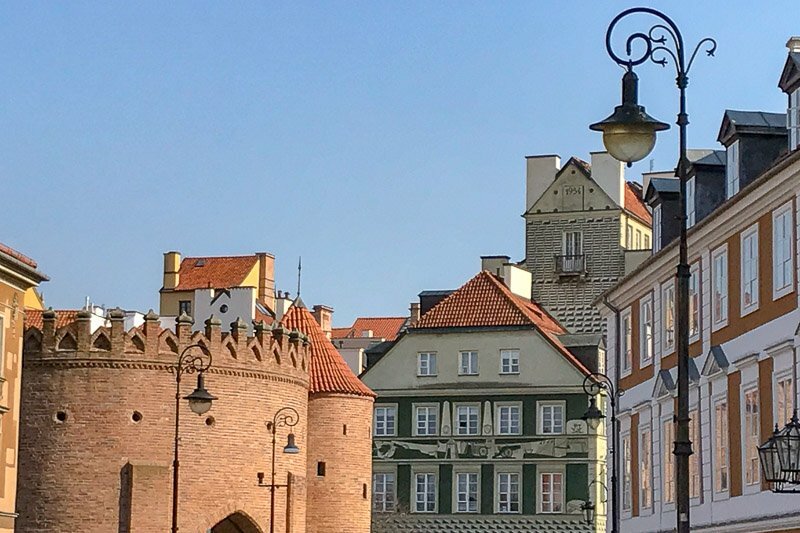 There is the Old Town Market Square surrounded by cute little buildings, and now filled with restaurants and outdoor dining spaces. 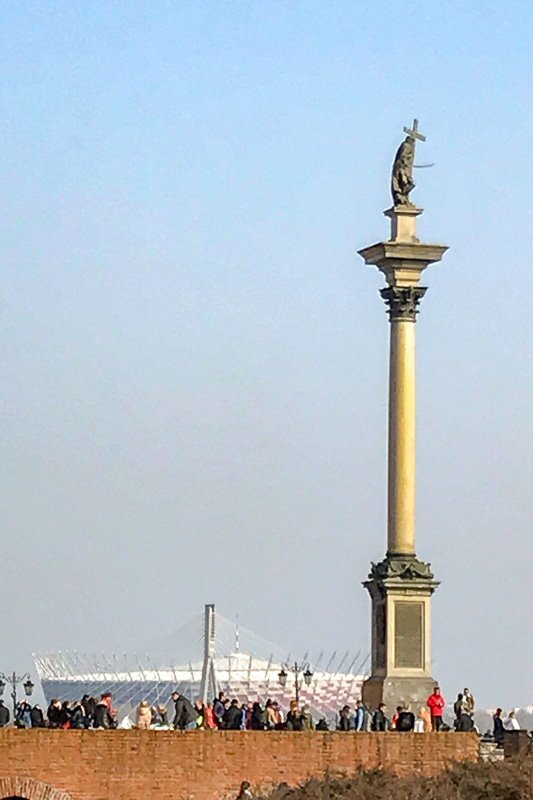 Right in the middle is a mermaid statue, the symbol of the city of Warsaw. 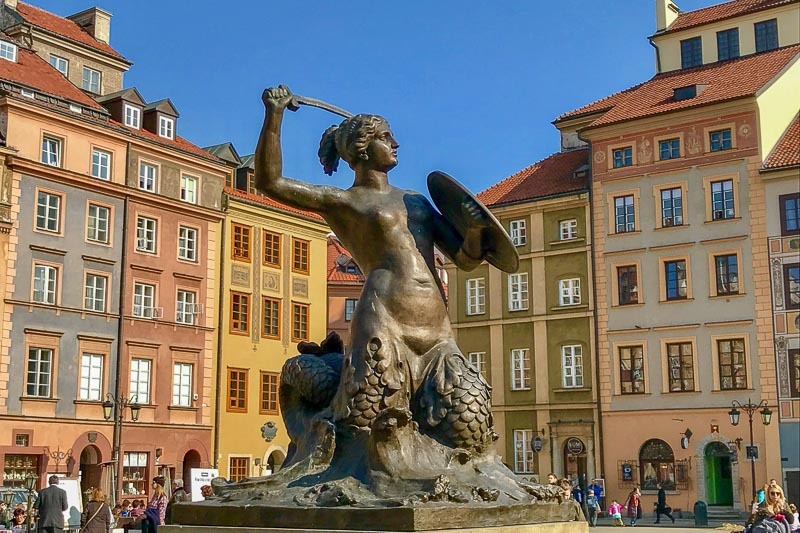 She’s pretty impressive, and not too unlike that other famous mermaid in a different European city – if you can ignore the sword she carries. 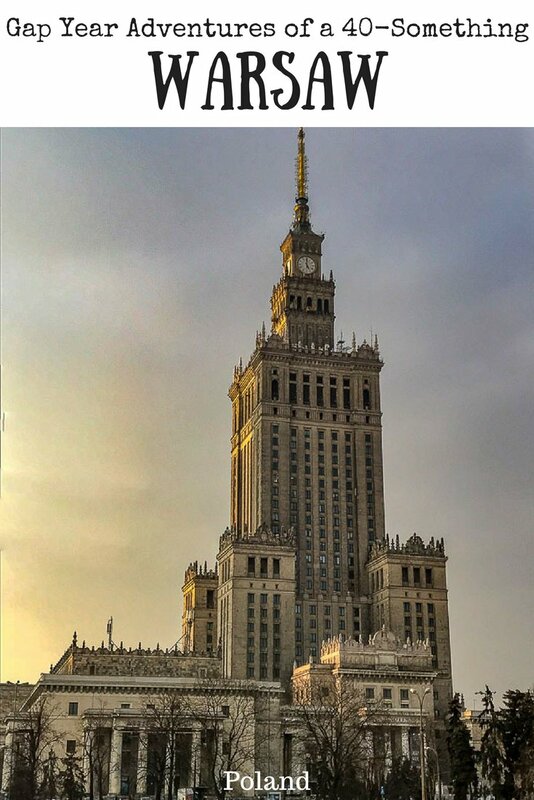 All those building make up the Warsaw Museum. The sunny day and the weekend crowds had artists out selling their wares. One of Warsaw’s favourite sons is Chopin. There are reminders of him around the streets, including a few benches that give snippets of his life. They also play pieces of his music, bringing to life the works he is famous for. 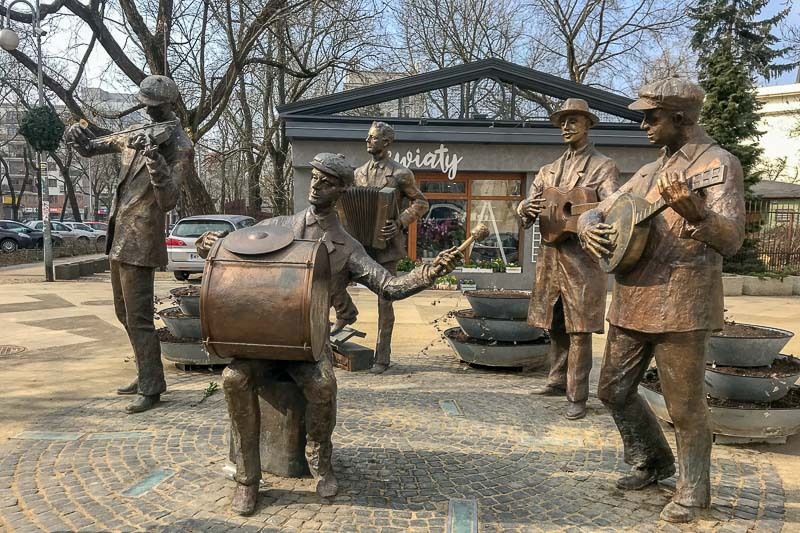 During summer there are free Chopin concerts in the park, and during the rest of the year there are multiple venues throughout where visitors can catch a concert put on by local performers. 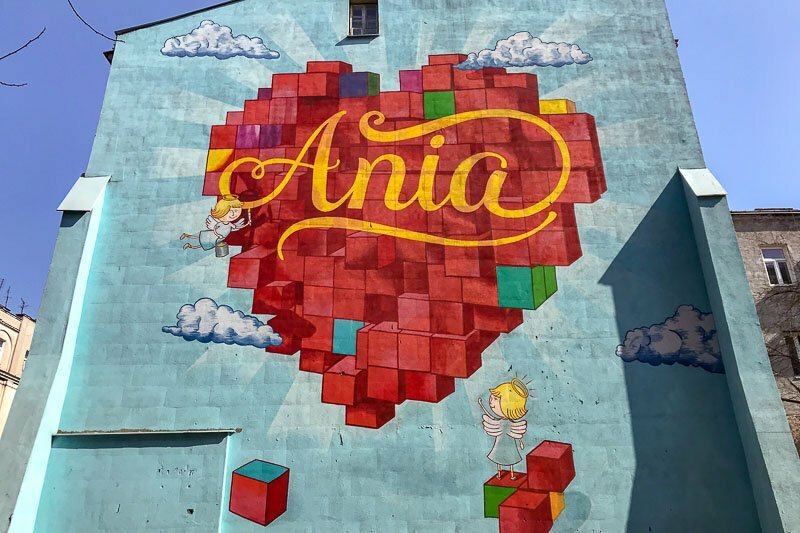 Warsaw also has a favourite daughter they like to tell the world about, and rightly so, as Marie Curie was born and grew up right in the Old Town. She was proud of her Polish heritage, thus the naming of one of the new chemical elements she discovered Polonium in honour of her place of birth. She was the first female Nobel prize winner, and went on to win the prize twice. Her daughters were also scientists and Nobel prize winners too – definitely something for Warsaw to be proud of. 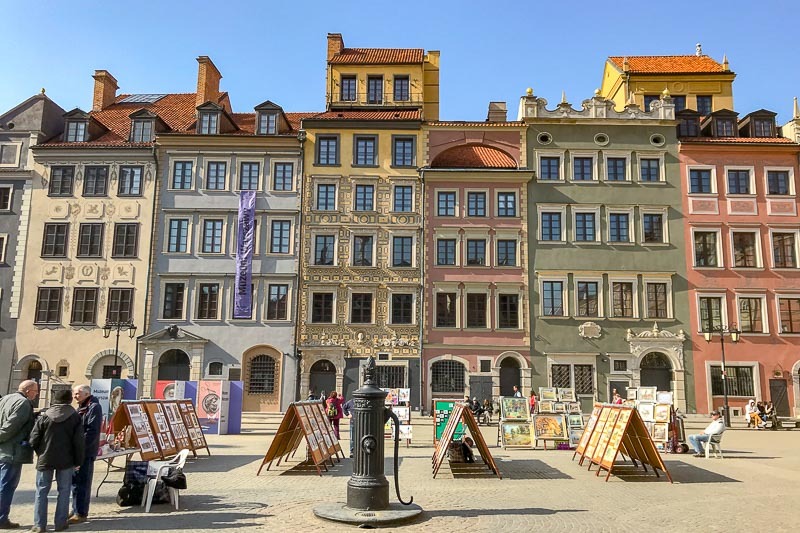 I actually quite liked the Warsaw Old Town. It had a really nice feel to the place. I know, that’s not really a tangible reason for liking it, and it could possibly have been the sunshine and the buzz from the crowds, but I enjoyed my wander in the sun learning about the town. Our guide was knowledgeable and humourous. If you have not been on a free walking tour, you really need to give it a go. I always find the guides to be fantastic, and when it is tips-based, they really do their best to entertain and inform. I can only think of one guide ever on a free tour who was not fantastic, and I think maybe I just didn’t appreciate his sense of humour. 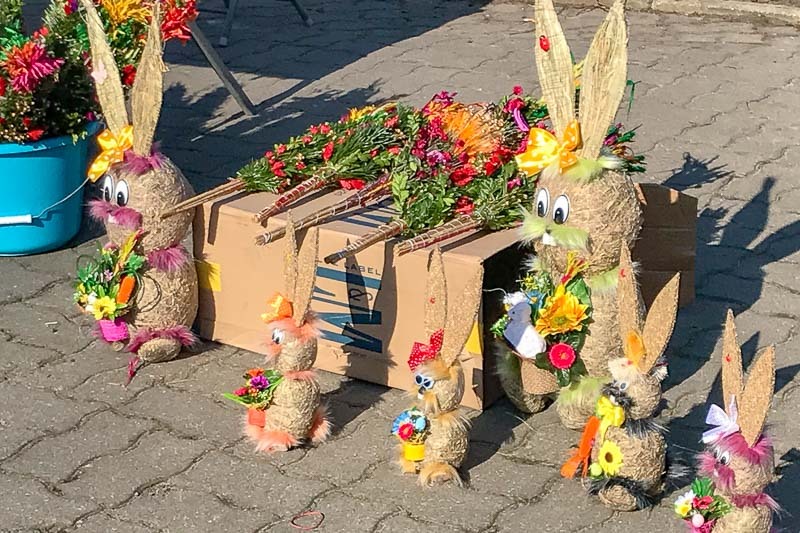 We were in Warsaw on Palm Sunday, and saw many of these offerings on sale around the city. There are not a lot of palm trees in Poland, so these floral arrangements symbolise the original fronds used to pave the road. 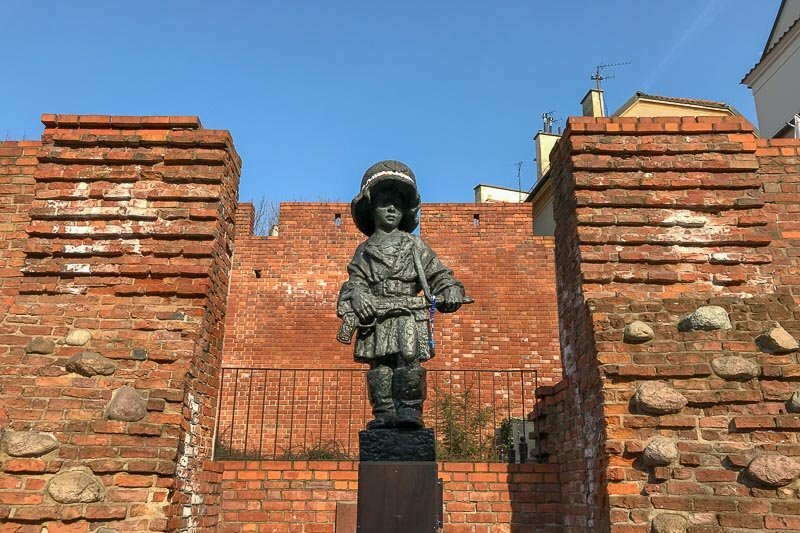 Monument to the Little Insurgent. This is a little contoversial becasue it depicts a child with a gun. Tour over, we had one more stop before we made our way back to the hotel for happy hour! We had to go to the Hard Rock Cafe. I am totally sick of eating at them, so this time I told Simon have could buy a tshirt. Probably cost the same as a meal, but I just couldn’t face nachos, no many how good they are. While here we continued our hunt for the elusive Pull & Bear t-shirt our daughter MacKenzie wants (we don’t have Pull & Bear in Australia) with still no success. I’m now fairly sure it’s been discontinued, even though it’s the basic Pull & Bear shirt. Happy Hour beckoned and boy were my feet sore from walking all day, so we made our way back to the hotel, got ourselves comfortable in the lounge and went to work on some of the many tasks I have on my list! We walked past this soviet style building, the Warsaw Palace of Culture and Science. It felt like deja vu as there is a very similar building in Vilnius (our previous stop) that houses the Academy of Science there. The next morning started in much the same way, getting a tram to the same place in Praga to meet a guide for yet another walking tour. This time it was the Warsaw Alternative Tour. It was again through the Praga district, but this time we learnt more about the history of the area. A lot of the tour focused on WWII, showing how people lived and survived. There was a look at some of the different types of architecture, and since this was the area many Jewish people lived, some information on them too. All three of the walking tours we did were through Walkative, who do both free and paid tours all over Poland. 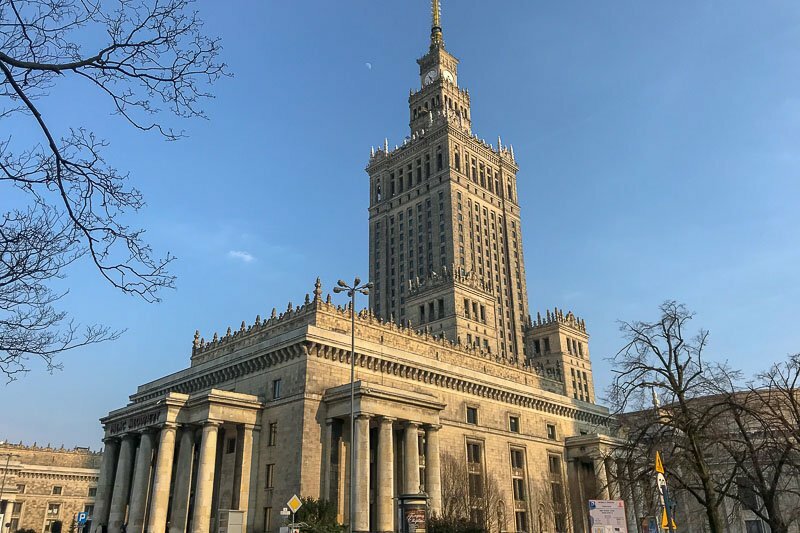 There are other tours there do in Warsaw too, and I would have happily done more if we had more time here. After our tour we again walked back across the bridge and into the Old Town. Oh boy what a difference a day makes! The crowds were now non-existant, and we wandered around the many streets we had walked the day before. This time I was able to get some photographs without the crowds, but unfortunately without the brilliant blue skies either. The Old Town Market Square on Monday was much quieter than the day before. Now there is space to just sit on a bench and people watch. 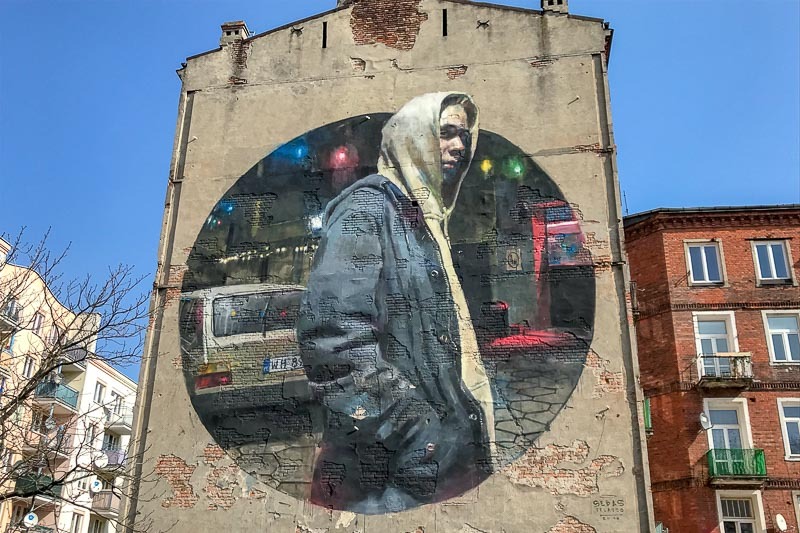 As we took the scenic route back to our hotel to rest our weary feet we came across even more interesting street art – it really is becoming a huge thing in Warsaw. 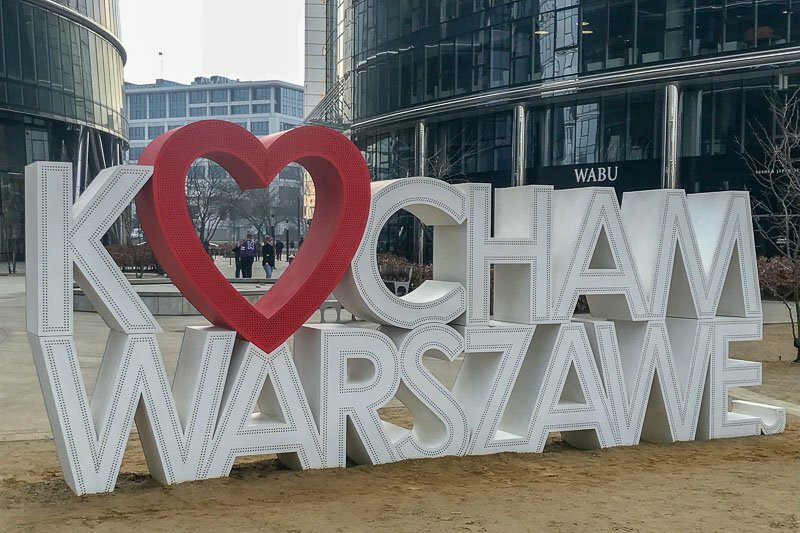 We found the ubiquitous “I love Warsaw” sign in a park area between some new buildings. It’s hard for me to tell though if the area was sparse simply because it was the end of winter and nothing green has grown yet, or if the area is still under construction – maybe a bit of both! Every city worth it’s salt needs one of these sign for Instagram shots! Our last evening was again spent in the Hilton executive lounge. Boring I know, but perfect for getting some work done and it means after paying the extra to stay here we get value for our money. I spent the evening putting together a presentation I was working on to bid for a Bookcrossing world convention to be held in Australia, and I seem to have volunteered myself to be a big part of the organising committee. It’s pretty exciting though, and I look forward to showing off Australia to all our visitors now that our bid has been successful. We woke in the morning with plenty of time for a leisurely breakfast before making our way to a nearby train station to catch the train to the airport. We approached the information desk to find out which tickets to buy, then again to find out which platform the train stopped. There really wasn’t a lot of information for tourists, but to be fair, we also weren’t at the main central station. As we are standing on the platform, Simon looks at the rail map and says “Are you sure Chopin airport is the right one? There are two airports on this map!” My response “You booked the tickets!”. There were a few minutes of panic then. The email from the airline just said “Warsaw”, the wifi wouldn’t work, and the people I tried to ask didn’t speak English. We got on the train slightly unsure if we were going in the right direction. We were reasonably early, so I just hoped if we were wrong we could find a speedy driver to get up to the right place. We got off the train at the airport, and breathed a huge sigh of relief to see our flight listed on the departures board! Disaster averted, but there always seems to be a bit of a drama when we have a flight to catch. Note to self – I will book all flights from now on! 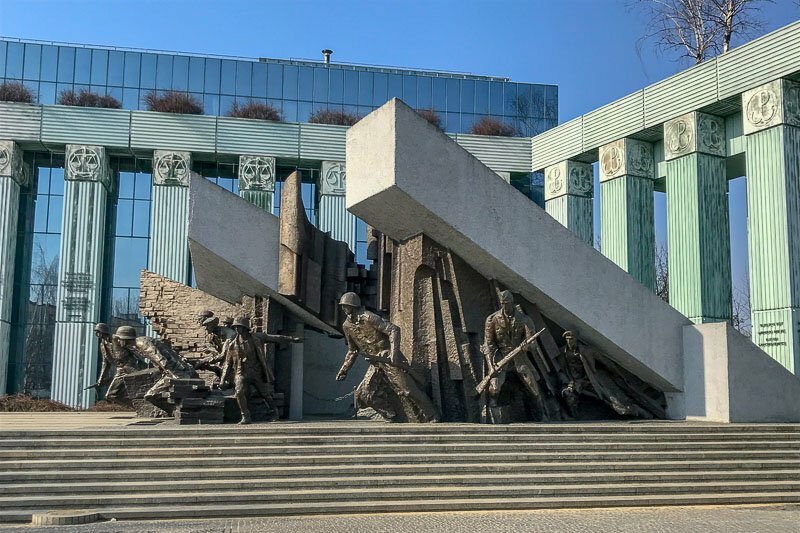 Warsaw is definitely worth a visit. Our time here was short, and there is so much more to do. We didn’t get to a single museum, or church or other attraction, let alone investigate day trips outside the city. Yet another place to visit again. Wifi is kind of hard for me to comment on. Of course it was good at the Hilton, but we didn’t really try to use it very many other places. It was so-so at the shopping centre we got our lunch on the first day. It worked but was slow. Even though there were wifi signs in the information office at the train station I could not get it to connect, and at the airport I also had connection issues. I swapped to Costa Coffee at the airport and it worked much better. The public transport we used was so cheap and also ran on time. I used Google Maps, which gave me a warning that it did not have the latest timetables, but it seemed okay. Poland is a cheap country overall. Apart from our accommodation, which included breakfast and dinner, we did not spend a lot. Tips for the guides, public transport and lunch each day were about it. Lunch for two of us in a shopping centre food court was about 30 zloty ($11AUD/$8USD). It would have been cheaper had we gone to a local milk bar instead.